Rewind to the Bike Test in Issue #108 of Singletrack Magazine, where Jason Miles pitched three titanium hardtails against each other. 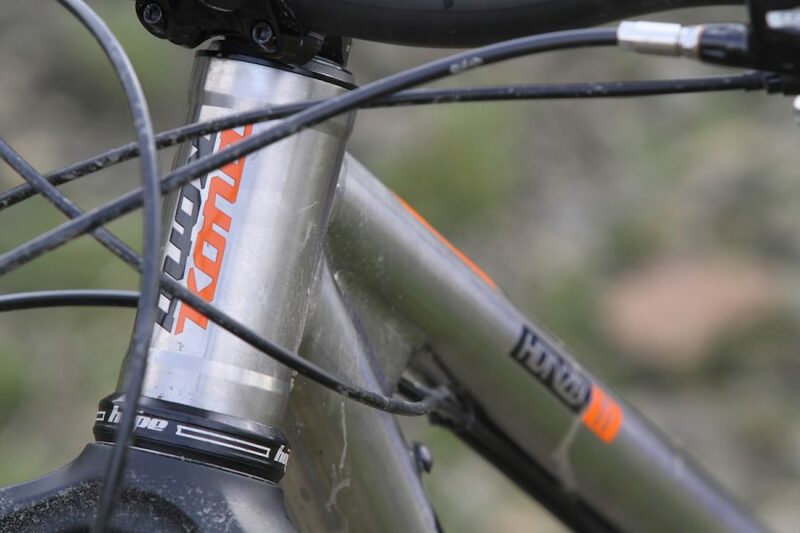 As soon as you see the Kona Honzo you know instinctively that it’s not a bike aimed at bimbling around on. The very low-slung top tube, the massive tyre clearance, the big Hope 4 piston brakes and the slack, RockShox Pike-equipped front end shout ‘FUN!’ to some and ‘Accident and Emergency’ to others. The Kona Honzo Ti went head-to-head with the J. Guillem and Stanton Sherpa Ti as part of titanium hardtail group test in Issue #108. 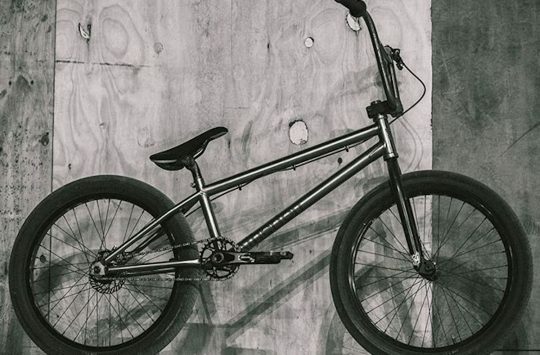 The (Taiwanese-made) frame is on the well-built end of the spectrum. There’s a large lump of titanium welded at the front between the top and down tubes. There’s a great big plate attached to the top of the seat tube down to the top tube. All the tubes look like they were built to last. 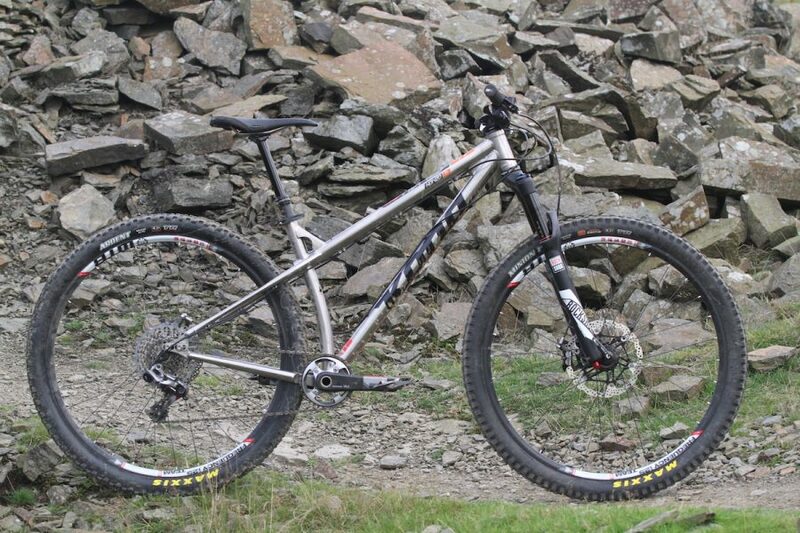 Based on the existing Kona Honzo, but with lovely titanium tubes instead of steel or alloy. 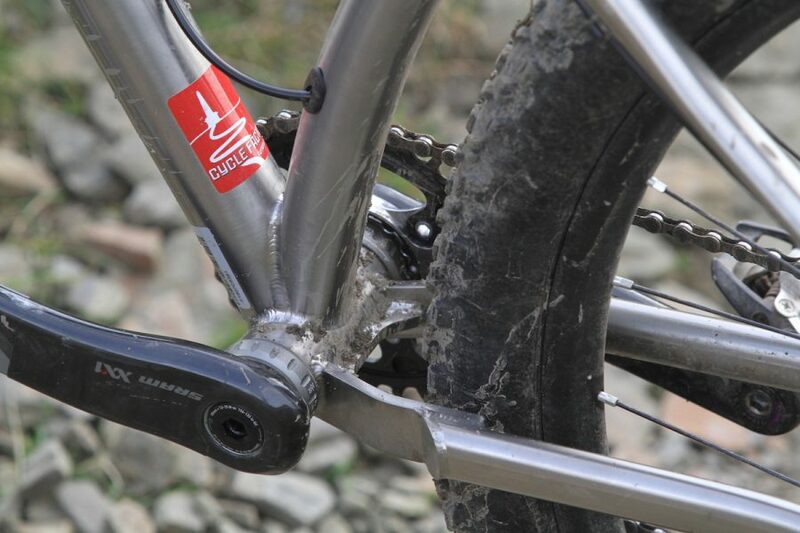 The incredibly short chainstays (415mm!) are also purposeful-looking and don’t appear to be in any way ‘springy’, ‘vibration absorbing’ or any other titanium-based ride quality hyperbole you can think of. Nope, the Honzo just looks plain HARD. 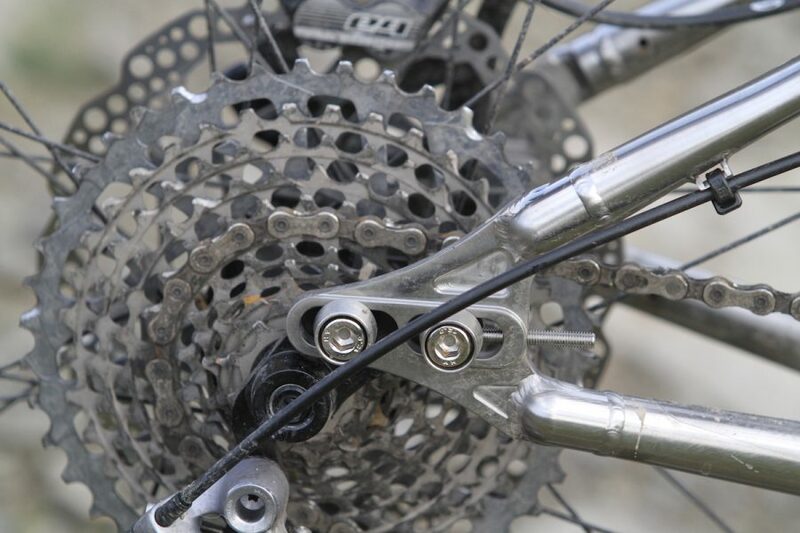 The rear dropouts are adjustable, so you can play with chain stay length to alter handling or tension a chain for a singlespeed setup. 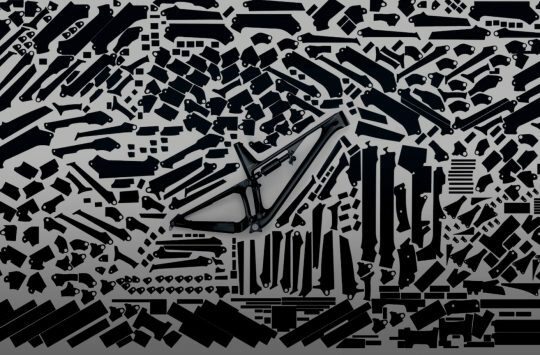 There are modular dropouts so that you can run the frame geared – this one had 142x12mm thru-axle ones – or singlespeed, and due to the extreme bend in the seat tube (to slam the rear wheel as far inward as possible) there’s no way you’re going to be using a front mech. 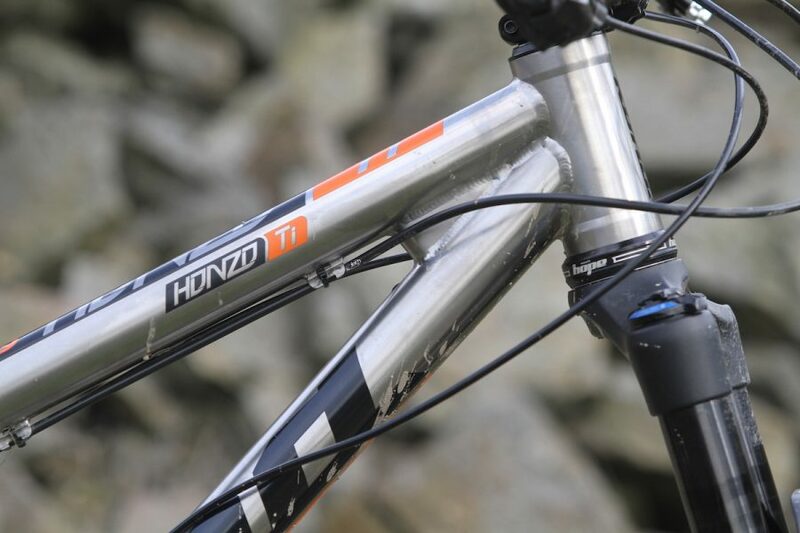 The Honzo Ti is thoroughly modern, with a slack head angle and a steep seat angle. The dancing man gives a wave of approval. In real terms, the seat tube angle is very steep indeed – 74.5° in fact – which probably helps the bike climb, but probably doesn’t help comfort levels. You really do feel all of the bumps on this bike – if there’s a big rock or a bump, you stand up. I mean, you’d probably stand up anyway, but it’s nothing like the smooth ride of many other Ti frames in spite of the big Maxxis Ardent rear tyre. 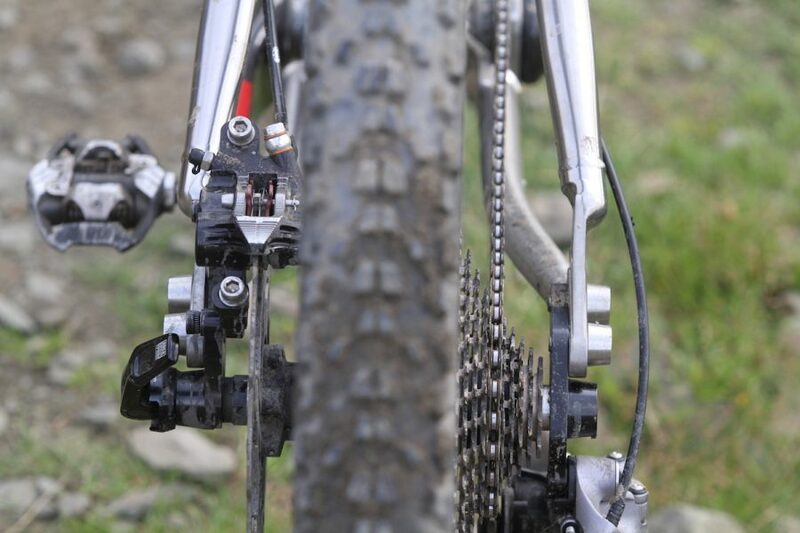 A tidy chain stay yoke increases tyre clearance for those super-short chain stays. Our test bike came built with some really high-end parts – SRAM 1×11, XX1 carbon cranks, a 120mm Pike fork, KS Lev dropper post and Hope Tech 3 203/180mm brakes. A super-short Race Face 40mm stem and wide bar complete the ‘throw me down a steep hill’ character. 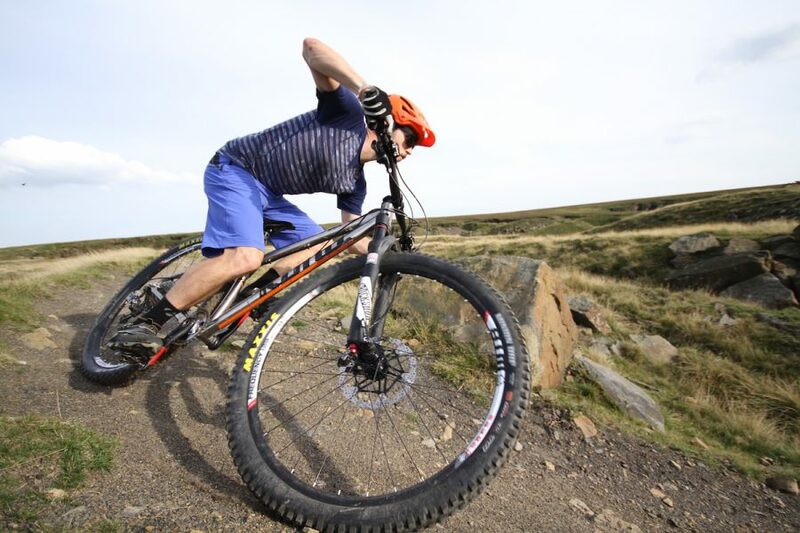 The Maxxis tyres were perfect for this bike and as capable as ever. 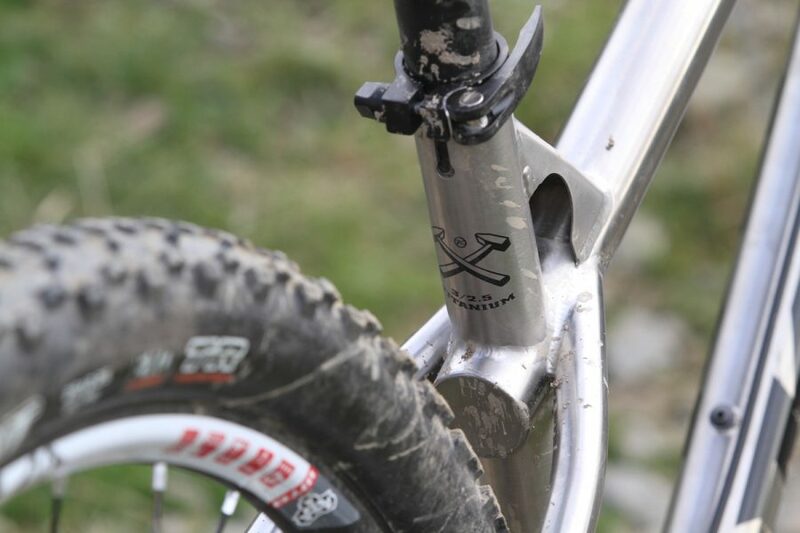 Modular bolt-on dropouts for a 142x12mm thru-axle. The ride is no surprise. Given the (relatively) light weight of the frame and the posh build kit, it’s incredibly easy to get the Honzo airborne, even (as I discovered) when you don’t particularly want to. 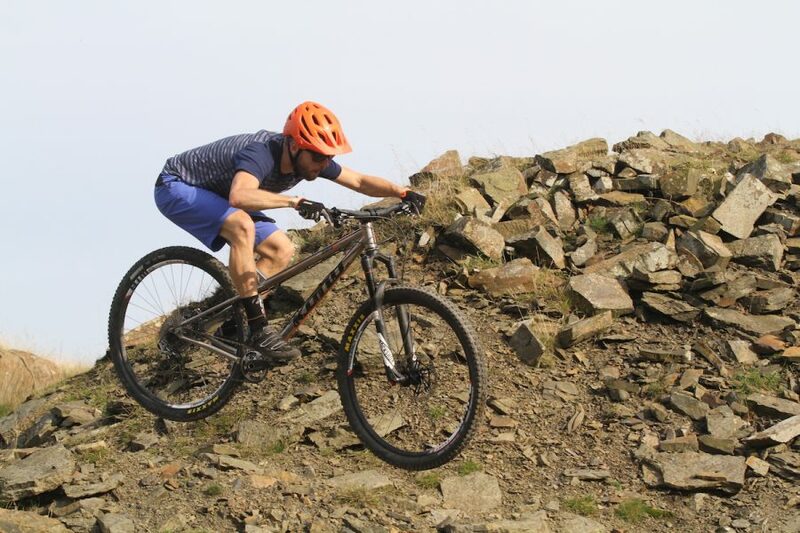 On jumpy, trail-centre-type rides the amount of speed you can carry into a technical section can be alarming if you’re not concentrating – to the point where a ‘technical section’ can easily become a ‘rapidly deteriorating situation’. 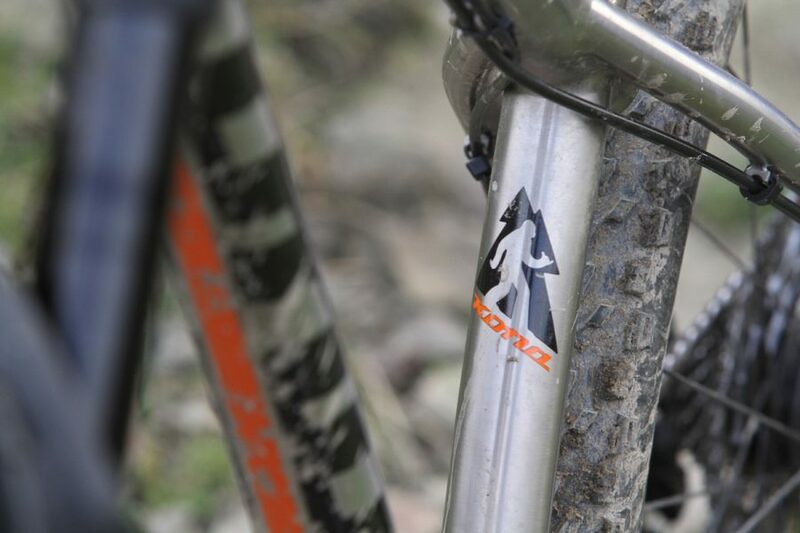 The Honzo is ridiculously playful for a 29in hardtail. This thing riiiips! It’s an incredible bike to ride downhill, in fact I found myself riding faster and faster downhill until I reached the point where my enthusiasm and skill level converged and I landed in a heap. That point of convergence probably occurs earlier for me than many riders though (probably the kind of ‘gravity’ rider this bike is actually aimed at), so I expect in the right hands the Honzo could be terrifyingly quick. Cornering is an absolute pleasure thanks to the short back-end. You’ve really got to concentrate on what you’re doing. As the bike picks up speed you end up ploughing into stuff just because you can – the big Hope brakes, tough WTB 29er wheels and the Maxxis Minion up front, along with all the other attributes of the bike I’ve already mentioned – mean that things start to happen very quickly indeed and you’ll either amaze yourself at what you managed to ride on a hardtail or you’ll remember why you don’t normally ride that particular bit. It’s hard to tell how anyone could justify buying a Honzo Ti. 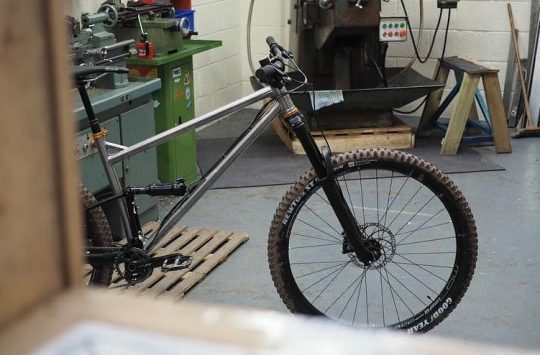 The same bike is available as an aluminium frame with a much lower price tag, probably the same level of stiffness (aka discomfort), and the same amount of trail-smashing, high-speed, bonkers-ness. It is a very cool bike though, one that you’d wheel out of the shed on special days where you’ve not got a skiing holiday/wedding/job interview coming up. As long as you don’t crash too badly you’ll be giggling for a few hours afterwards, too. Jason says the Honzo Ti smells like A&E. Presume when you listed the kit specs, you meant to say they were for the Honzo, not the J. Guillem Tomir ? Aha – just making sure that someone’s on the ball!